is shenzhen history a good investment? On December 28, 2013 Da Ken Art Center (大乾艺术中心) opened an exhibition on the Devout and Chaste Girls School (虔贞女校), which was built as part of the Basel Mission. The opening brought together a strange but uncannily representative demographic — young Shenzhen gallerists (Da Ken specializes in early photography), Dalang officials, Hakka Christians, aging villagers who went or taught at the school, activists in Shenzhen’s literacy movement, and representatives from the Basel Mission in Hong Kong. There were also a good number of public intellectuals who came out to show support ongoing efforts to re-member Shenzhen history, Christian, nationalist, and pedagogical. After the opening, Yang Qian and I had coffee with Zhang Yibin (张一兵) and Li Jinkui (李津逵), two of Shenzhen’s more active public intellectuals. Their interventions, however, take very different, albeit supplementary forms. Zhang Yibin is interested in objects — blunt and silent, stubborn bits of matter and how they become meaningful through archaeological speculation and what might be glossed as “cultural capitalism”. Zhang Yibin was responsible for rediscovering the school, which had been closed in 1986 and making its historic importance known to the Dalang government. He has been involved in the reconstruction and preservation movement for over six years. In contrast, Li Jinkui is relentlessly and charmingly verbal. An economist by training, Li Jinkui came of intellectual age in the 1980s, when “economic reform” was a code for “social liberalization”. For several years now, he has organized a salon at Yinhu, where intellectuals gather to debate issues that range from urbanization through phenomenology and economics to the historic meaning of Shenzhen and include pedagogy in all its permutations — the social role of education, the importance of raising the level of education throughout Shenzhen specifically and the country more generally, the history of education, and the need to reform the Chinese system of education. In fact, Li Jinkui gently moderated our after opening coffee talk, which focused on the historic production of cultural ecologies. Zhang Yibin’s analysis of the current Shenzhen preservation movement hinged on a two-pronged analysis of (1) non-material culture and (2) 闲钱, which can be translated as spare money, disposable money, or leasured money. Zhang Yibin noted that most cultural history is non-material, composed of stories and impressions and feelings and suppositions, while less than 1% of the archaeological record is actually material. He then reminded us that although the shapes, textures and sizes of objects vary, there is no meaningful difference between them in terms of historic preservation. Instead, we distinguish between relics and garbage, because of the stories we tell and how much “disposable money” is at hand; the more disposable money, he emphasized forcefully, the more we invest in objects and their social transformation into relics. The way disposable money mediates the social transformation of objects into relics clearly frustrated Zhang Yibin, who has failed more often than he has succeeded to bring Shenzhen’s archaeological record into the public sphere. Instead of an intellectual pursuit that helped to enrich a society’s cultural ecology, he suggested, historic preservation has become yet another instance of collecting relics. As such, it hinges on the whims of leaders rather than on a consensus over what constitutes history and archaeological research. The background for his frustration is the robust Shenzhen antiquities market and concomitant disinterest in the area’s history. In Shenzhen, there are two primary agents accumulating relics — individuals and state cultural institutions, such as the Dalang Street Office. As elsewhere in the world, wealthy Shenzhen individuals collect for personal reasons that range from desire and taste to economic investment. At the same time, municipal cultural institutions have shown little interest in the area’s past, preferring to showcase the Municipality’s role in modernizing Post Mao China. Moreover, attempts at historic preservation at Nantou Old Street, Dapeng Fortress and the Hakka compounds, for example, have not been embraced by the general public, which remains largely ignorant of Shenzhen’s modern and imperial history. Indeed, even the call to preserve old Hubei Village, an example of a wealthy late imperial and republican architecture (located immediately east of Dongmen) has slipped well under public radar. This background also explains Li Jinkui’s support for the collaboration between the cultural bureau of Dalang Street Office, the Lankou Christian community, literacy activists and Da Ken. Li Jinkui advocates a broader and more ethical understanding of public culture. To achieve this, he sees an important place for non-material cultural — not simply story-telling, but rather and fundamentally, education. For Li Jinkui, one of the roles of government is to use its disposable money in order to curate the City’s historical understanding. Although he agreed that only stories and money allow humans to differentiate between relics and garbage, it did not follow that all garbage ought to be transformed into a relic because not all stories were worth telling; we define ourselves, he suggested, through these stories. Moreover, the choice of how to dispose of one’s money, especially at the level of government, is for Li Jinkui and like-minded intellectuals a question of public ethics and the concomitant creation of social value. In this sense, the Dalang Street Office decision to preserve a school as well as the history of extending education to girls was a story that should be commemorated with objects and disseminated in public forums, such as Da Ken. In turn, Christians and literacy advocates can use this history and its objects to shape an ethical and heterogeneuos public sphere. China favors boys over girls. It is a custom with a long history. Many say that a lack of education is a virtue in a woman. But they do not realize that God made men and women as one body. God did not only give souls to men, but also to women. There were men, and then women were created. However, there were women, and then boys and girls could be born. In front of God, men and women are equal. Men strongly love education. But women love education even more because they are the nation’s mothers and they carry a heavy responsibility for the country. The country is made of customs. The people can have high or low character. Their words can be true or false. Their morality can be complete or lacking. All of this is created by the country’s mothers. The responsibility that women carry is therefore extremely heavy. It is an important moral obligation, which must be at the front of all future efforts to create the best model of moral words and deeds. We must work until we succeed. 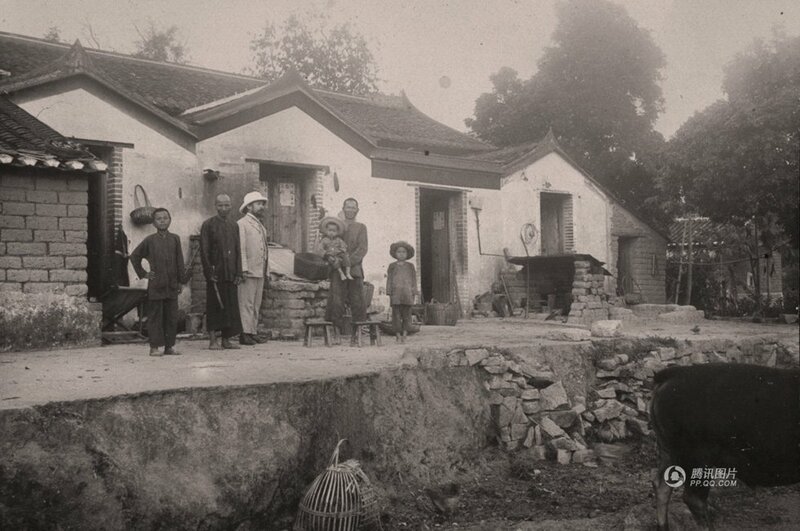 For the curious, Tengxun has uploaded 22 photographs from the exhibition, which documents the cultural geography of fin-de-siecle South China. There are young Hakka girls, Western missionaries and their families, as well as impressions of the already globalized rural landscape — traditional row houses, fields, and the new school, shimmering white beneath elegant hills. The show itself is up at Da Ken Art Center, located in the northern section of Ecological Park, OCT (just above the AUBE offices and row coffee shops and restaurants). Hours, 10:00-6:00. Unlike the online exhibit, the actual exhibition includes objects and a model of the restored school and church. This entry was posted in noted, photos and tagged accumulation, basel mission, christianity, cultural history, da ken art center, hakka, history, relics, south china. Bookmark the permalink.